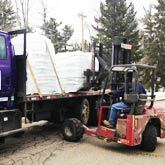 We tagged along with Rob (one of our NH drivers) on a 1-ton Value delivery of Cleanfire Wood Bricks. You’ll see in the video below that the forklift is mounted on the back of the truck, which parks in the road. The driver lowers it down to the ground, uses it to remove the fuel from the truck, and then drives it up the driveway to place the pallet where he’s instructed. The video below shows the entire delivery, and is a great example of a seamless experience. Knowing his wood bricks would be dropped off that morning, the home-owner moved his car out of the way to keep the path clear for Rob. 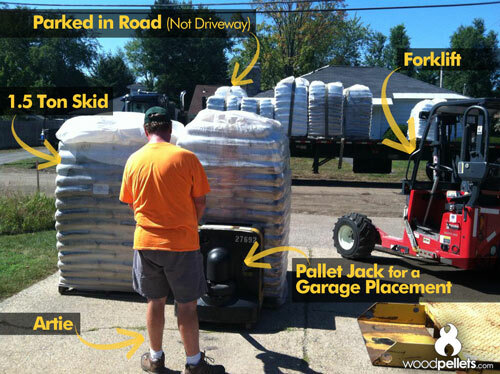 At the time of ordering, he requested the pallet to be placed in the driveway, about 10 feet in front of the shed. 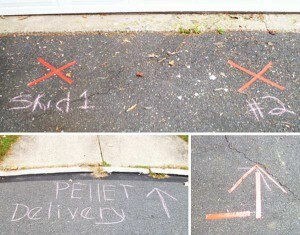 As you can see, the customer isn’t present for this driveway delivery. As long as your instructions are clear, and you let us know exactly where you’d like your fuel, our driver can handle it in most situations without your physical presence. Our driver will do everything possible to safely deliver your pallets where you want them. Of course, we have your contact information in case something comes up. Mix and Match Your Wood Pellet and Wood Bricks Purchase! Although we rolled out our improved online shopping cart a couple of years ago, we’re still getting surprised reactions from customers about it. 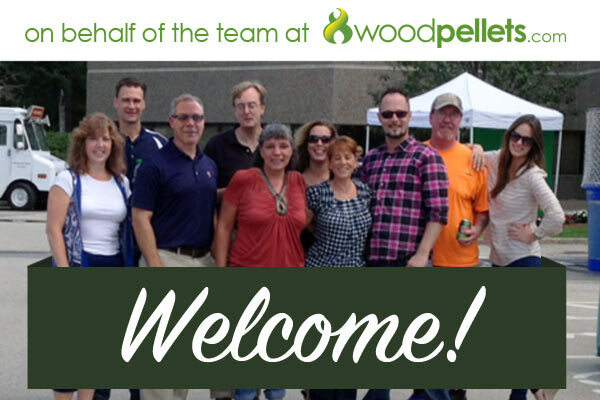 Did you know that you can select multiple products to add to your purchase when ordering from Woodpellets.com, both by phone and online? If you’re speaking to one of our experts by phone, just ask him or her about adding another type of fuel to your order. If you’re shopping online, simply select your desired brand and the number of tons you’d like from your zip code’s gallery. Once it’s added to your cart, select the Continue Shopping button that will appear on a pop-up box. This will bring you back to the gallery, where you can select another type of fuel. Continue this until you’re ready to view your cart, make any changes, select your delivery type and check out. strategic burning strategy for the next heating season. 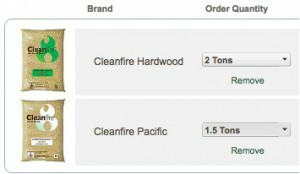 If you have been burning hardwood pellets, you might be curious about upgrading to softwood. Or, you might want to try something new. Perhaps you already burn softwood pellets, but you’re thinking about burning a softwood with a higher heat output during those extra cold months. Comparing your burning and heating experience with different types of wood pellets will help take care of those pellet curiosities. It’s completely up to you to decide when you want to place your wood pellet and/or wood brick order. However – do you want to have a quicker turnaround between your order date and delivery date? Do you want to be prepared for that first time you need to fire up your stove? If your answer is “yes” to either of those questions – take a look at our list below. Here are five common signs that you’ll start to see around the time when your fuel order should be (or should’ve already been) placed.